You will never look at Television the same way again after viewing this TV. It's truly amazing, the difference from standard Television and how it finds it's place in the home. Wall mounted with a trim kit you can add a Screen Saver to display your favorite art. Not like the old days when one would need to buy or build a cabinet to hide a television. Like ugly Betty the Television is only getting better looking with age. Once again, Sharp, a leader in LCD technology, establishes a new design standard for LCD TVs. With a screen size class of 52", the AQUOS® LC-65D64U raises the bar by fitting a large screen size into an incredibly small footprint. By changing the layout of circuits inside the LCD panel and by reducing the number of parts, Sharp engineers developed the Slim design which reduces depth by 25%, allowing placement of the LC-65D64U in virtually any setting. The LC-65D64U utilizes Sharp's proprietary Advanced Super View / Black TFT Panel with multi-pixel technology, providing 10,000:1 Dynamic Contrast Ratio with Enhanced Picture Contrast Technology and 4ms response time. The LC-65D64U features built-in ATSC/QAM/NTSC tuners and includes 3 HDMI™ (version 1.3) inputs, compatible with 1080p signals, X.V. Color, a PC input and 2 HD component video inputs. Side terminals are included for wall-mounting convenience as well as RS-232C input for control. 10,000:1 Dynamic Contrast Ratio and 4ms1 Response Time produces spectacular picture quality. Three HDMI™ (version 1.3) and Dual Component Inputs for the ultimate in terminal flexibility. All HD inputs are compatible with 1080p sources and compatible with X.V. color for extended color gamut. Sharp's AQUOS LCD TV viewing angles are so wide, you can view the TV clearly from practically anywhere in the room. Enhanced Black Level provides the deepest, most accurate blacks of any flat panel TV. 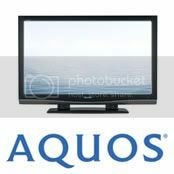 AQUOS LCD Televisions are very bright. You can put them virtually anywhere – even near windows, doors or other light sources – and the picture is still vivid. AQUOS engine with ASV Technology provides high-performance video processing for the brightest, most vivid colors and images. Screen Size Class 65" also available in 42" 46" 52 "